Grandeur, a play by Han Ong produced by Magic Theatre in San Francisco, is an intimate play about a larger than life performer, Gil Scott-Heron. A black writer, poet, performer and political activist, Scott- Heron is famous for being the “Godfather of Rap”. His words and his songs have been sampled over and over, by Salt-N-Pepa, Kanye, Common, Kendrick Lamar, Drake, Rihanna and that’s only the tip of the iceberg. His influence on rap and hip hop as as artforms and as tools of political expression cannot be overstated. This play takes place in a single afternoon after his final album release I’m New Here, 40 years after his heyday, and many years into a crippling crack addiction. Grandeur is playwright Han Ong’s return to the stage after a sixteen-year absence. One of youngest recipients of the MacArthur Genius Grant,his talent shines through in this nimble and absorbing play. 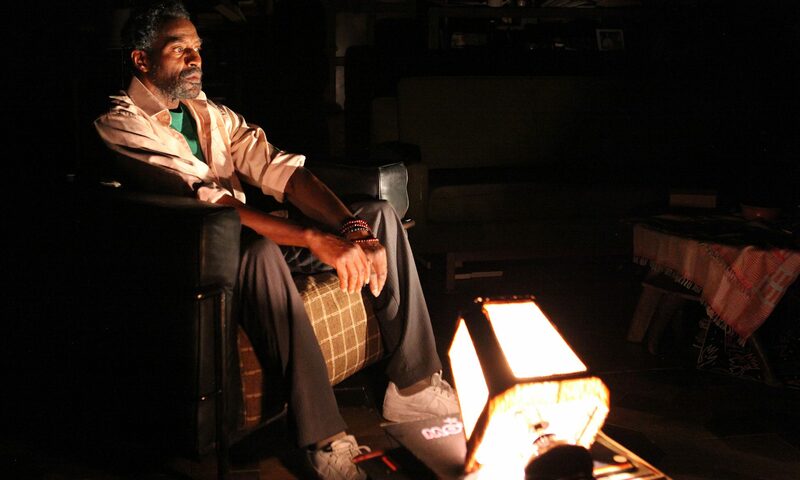 It’s a tour de force for Carl Lumbly who plays Gil Scott-Heron with a sharpness and a humor that stings and entertains. And yet, fourteen months ago when I was a member of the Magic Theatre Literary committee, I read the play and had strong reservations. Sitting the audience, I was prepared to have my mind changed, and in many ways it was. Dialogue that had fallen flat to me on the page crackled onstage with the direction of Magic’s Artistic Director Loretta Greco. The underwriting of Steve Barron (Rafael Jordan), the aspiring New York Review of Books journalist interviewing Gil Scott-Heron, seemed more of a deliberate choice to make him an everyman rather than a lack of interest by Ong in anyone who wasn’t Gil Scott-Heron. But the question that had caused me to reject the play in my initial reading still filled the back of my mind: Why tell this Gil Scott-Heron story? Grandeur is a good play. It has on a refreshingly straight forward, non moralistic attitude towards drug addiction. Scott-Heron is affected by his crack use, but he’s not a groveling, pathetic lesson. He’s an ornery, expressive old man with a gift for one liners, little patience, and a knack for getting people to give him what he wants. The single flashback that portrays him completely and uncontrollably high as the train rushes onward, and tweets about his career and downfall flash by is one of the most inventive and visually interesting scenes in the entire play. Miss Julie (Safiya Fredericks), his honorary niece and caretaker is a sharp reminder of all the women who keep the careers of famous men afloat without receiving any of the credit. Jordan’s acting talent shines in the second act as his anger at Scott-Heron for losing his heroic luster bursts through, and it becomes clear that Scott-Heron represents Barron’s deepest ambitions and his greatest fears as a black man and writer. There is only so much space on the stage. Every theater company, every year wades through hundreds of options to decide what four, six, eight stories are worthy of being told that season on their stage, and even in the most progressive of theaters there is a comfort in familiarity. We produce and watch the same shocking and “edgy” stories over and over again until they become part of our consciousness. Lesbians die, women are madonnas and whores, and black men are felled by drugs. On stages across the country, smart, accomplished playwrights examined these tropes, they investigate them, they burst them open, they show their flaws and why these stereotypes are harmful. Yyet the logical next step of writing plays that don’t include these stereotypes, that don’t rely on exploiting the pain of minorities or have women who are people and not metaphors seems ever evasive. Grandeur is a play about a man who’s most famous work is “The Revolution will not be Televised”, but this Gil Scott-Heron story is entirely non-threatening for white consumption. It’s is a safe story, centered around his crack addiction, and with very little about his music and almost nothing about his politics. It’s a play about a writer’s last hurrah long after his drive for success has dried up. A story that Ong, who’s spoken publically about falling out of love with dramatic writing after staggering initial success may have felt a strong kinship with. There is nothing inherently wrong with wanting to explore stories about forgotten icons after the world has moved on without them, and telling stories about addiction without moralizing is an impulse I applaud. But every theater makes choices. Staging a play about a black man famous for his anger at the treatment of black Americans and his revolutionary music that expressed it, and stripping all of that away to make a story about addiction that ends with Scott-Heron taunting his interviewer saying “don’t you wanna look away?” as he lights up, the glow of the crack pipe in the dark theater as the final image the audience sees, is a choice. Similar choices are made in theaters across America everyday, and it says something about the stories that we’re comfortable telling, and what we see as worthy of our time, money, and stages.